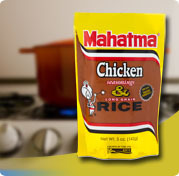 Mahatma Chicken Rice Mix combines savory herbs and chicken broth with the finest quality long grain rice, onions, garlic and bell peppers with toasted vermicelli for a delicious side dish that's simple to prepare, goes with almost everything and is a family favorite. Bring 1-2/3 cups of water and 1 tablespoon margarine to a boil in a medium saucepan. Stir in rice mix, cover, reduce heat and simmer for 20 minutes. Fluff lightly with fork and serve. Enriched Long Grain Rice [rice, niacin, iron (ferric orthophosphate), thiamin (thiamin mononitrate), folic acid], Toasted Vermicelli (semolina, niacin, ferrous sulfate, thiamin mononitrate, riboflavin, folic acid), Chicken Seasoning [Salt, Monosodium Glutamate, Dehydrated Vegetables (Onion, Bell Pepper, Garlic, Parsley), Sugar, Modified Food Starch, Maltodextrin, Spices, Rendered Chicken Fat, Autolyzed Yeast Extract, Turmeric & Turmeric Extract (color), Dextrose, Disodium Inosinate, Disodium Guanylate, Partially Hydrogenated Soybean Oil, Natural & Artificial Flavors, Tricalcium Phosphate and Silicon Dioxide (prevent caking).] Contains Wheat and Soy.